Are Muslims the New Jews? In the twentieth century, the field of Middle East Studies was dominated by the graduates of only a handful of schools. Then, inspired by the horrors of 9/11, scholars from a variety of fields entered the discourse on terrorism, Islamism and the Middle East. Valuable contributions have been made by surgeons, psychiatrists, theologians and classicists. This injection of new ideas into a field grown insular and tainted by Gulf State (especially Saudi) petro-dollars offers great potential for fresh perspectives, but also for the same leftist biases that permeate most of academe, now delivered in new and clever ways. 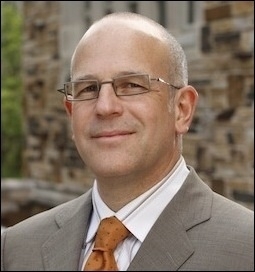 On March 23, 2015, historian Jonathan Judaken, Spence L. Wilson Chair in Humanities at Rhodes College lectured on "Judeophobia and Islamophobia" at the University of Rochester (NY). 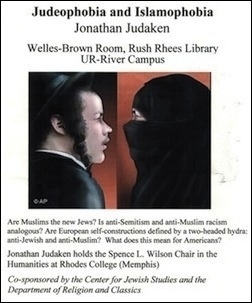 To an audience of approximately 50 people in an oak-paneled, marble-columned room at the Rush Rhees Library, Judaken gave a very selective history of Jew-hatred and Muslim-hatred. Referring to the Charlie Hebdo and Hyper Cacher attacks, Judaken argued that we are all swayed by a series of "metanarratives" characteristic of two kinds of thinkers. The benighted majority, seeing a rise of Islam in France and greater Europe but blind to the institutionalized prejudice against Muslims in France, is "driven by ideology," while the enlightened few who "see Muslims and Jews living and working together in Paris" are "informed by sociology." With some dramatic flair, he inquired of the audience members: "what's your story?" Judaken's lecture was heavily influenced by French philosopher and literary critic Jacques Derrida — the father of deconstruction. Like other forms of post-modernist thought, deconstruction is a philosophical and linguistic "tactic" designed, as Terry Eagleton puts it, "to show how texts come to embarrass their own ruling systems of logic; and deconstruction shows this by fastening on the 'symptomatic' points, the aporiaor impasses of meaning, where texts get into trouble, come unstuck, offer to contradict themselves." Derrida's characteristic technique is to select for close scrutiny a seemingly inconsequential part of a text, and then to dissect (deconstruct) the text, reducing it to an "endless play of signifiers" that never brings closure to meaning. For Judaken, it is the hyphen in anti-Semitism, and the concept of "Semite" and things "Semitic" that comprise the impasses of meaning. With some post-modernist sleight of hand, "anti-Semitism" was first discarded for "antisemitism" and then replaced with "Judeophobia." The concept of "Judeo-Christian tradition" was also deconstructed, as was the idea of "Oriental" in a predictable bit of praise for "the prescient Edward Said." A much-simplified description of the Crusades as an offensive campaign designed to kill Muslims, rather than a defense of Christendom, was followed with an exaggeration of Islamic contribution to Western civilization, culminating by crediting Islam with having "preserved, elaborated on and indeed expanded upon" Western thought. Once a post-modernist has deconstructed the "old ways" and "privileged" meanings, the path is clear for a new model of meaning offered in its stead. For Judaken, the erroneous, privileged idea is that Europe's Muslims are attacking Europe's Jews due to anti-Semitism (i.e., due to the fact that they are Jews). This allegedly outdated idea is "deconstructed" and then traded for the assertion that "Europe's Jews have become part of the hegemony of Europe…and are targeted by Europe's Muslims because of their European-ness rather than their Jewish-ness." According to Judaken, "Judeophobia has run its course," "Islamophobia is the new paradigm in Europe" and "Muslims are the new Jews." Judaken relied on the work of fellow post-modernists, Gil Anidjar, trained in comparative literature, and anthropologists Ivan Davidson Kalmar and Matti Bunzl. Bunzl is author of a book titled Anti-Semitism and Islamophobia (2007), which argues that "anti-Semitism was invented in the late nineteenth century to police the ethnically pure nation-state. Islamophobia, by contrast, is a phenomenon of the present, marshaled to safeguard a supranational Europe." Like Gil Anidjar, whose work has been covered by Hugh Fitzgerald, Judaken uses Derrida to subvert logic and distort facts of history. Like Ivan Davidson Kalmar, Judaken moves easily from scholarship to intimidation, as in this excerpt from Kalmar's 2013 book on Orientalism: "as anyone even slightly familiar with Islam knows, among the many names of God, al-ahram, the merciful, is uppermost. To describe him as a heartless purveyor of cruel punishment is simply false." The same kind of intimidation can be seen in Judaken's decree that anyone calling for a reformation of Islam, "constructs Muslims and Islam as primitive." This charge is made only to silence critics and is akin to the Post-modern accusation of "Other-ing" one's enemies. Judaken exaggerates the much-vaunted tolerance extended to Jews in Muslim lands after expulsion from Christendom. Judaken argued with some validity that Muslim demonization of Jews was influenced by Western, Christian demonization of Jews, but he employed the idea primarily to displace and expunge Islamic anti-Semitism. This itself is a form of "constructing Muslims as primitive," for it suggests they are incapable of understanding themselves. Judaken also exaggerated the much-vaunted tolerance extended to Jews in the Muslim world "where they were treated much better" after expulsion from Christendom. Much attention was paid to the Roman Catholic Church's 4th Lateran Council (1215) and its requirements for non-Christians to display their minority status. But the 4th Lateran Council came centuries after the Islamic tradition of forcing non-Muslims to wear clothing identifying their status. Long before the 4th Lateran Council, the so-called Pact of Umar spelled out the rules of dhimmitude — a concept that did not come up in Judaken's talk. He would do well to put down Derrida and read Bat Ye'or. In the Q&A portion, one questioner sought clarification on the assertion that "Muslims learned hatred of the Jews from Christians in the West, especially during the 1930s" by asking about the many passages in the Koran and Hadith exhibiting hatred of Jews. Judaken answered, "those passages aren't that important." Such a response is no longer acceptable after decades of Islamists from Khomeini to bin Laden, from the Muslim Brotherhood to ISIS, citing the Koran and Hadith in support of their demonization of Jews. Judaken needs to reexamine parts of the Koran such as 2:61, 2:97–98, 4:46, 4:160–161, 5:64, 5:78 cited by Islamists. He should put down Gil Anidjar and read Martin Kramer. A.J. Caschetta is a senior lecturer at the Rochester Institute of Technology and a fellow at the Middle East Forum.